This is seriously the most flavorful chicken I have ever cooked. Sweet paprika and lemon really make this peruvian chicken amazing. Use a good sweet hungarian style paprika. Roasting a whole chicken is easy, so don’t let it scare you. And it looks pretty! Buying whole chicken is cheaper than chicken breasts. If you don’t have a whole chicken, use either a whole chicken cut into pieces or several bone in breasts or thighs. 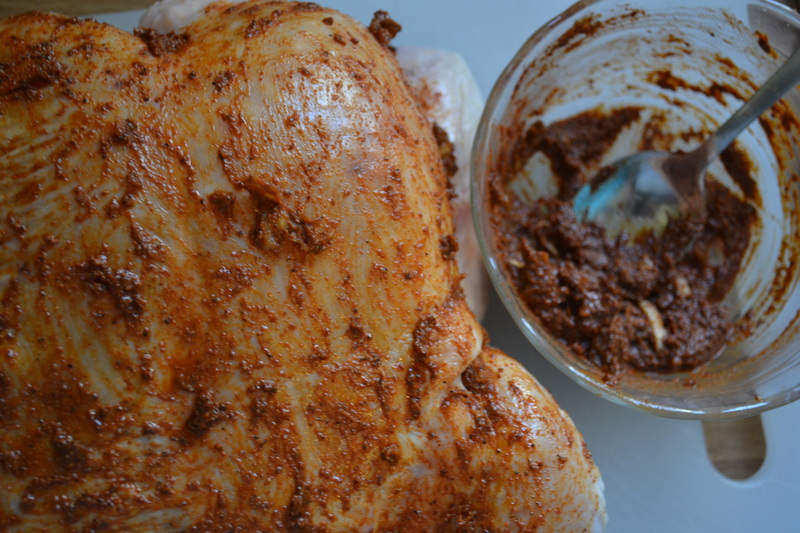 For whole chickens, rinse and pat them dry prior to applying the marinade. Marinading chicken for several hours prior to cooking helps keep the pieces moist and adds more flavor. However, if you are running short on time, I’m sure you can skip this part and just rub the bird down with the marinade. Did I mention that I looooove this marinade? Seriously, you can throw this on just about ANYTHING and it will make it better. This is a great one dish meal. The paprika and lemon make this recipe pop. For the roasted vegetables, use whatever you have on hand. I happened to have several sweet potatoes from the farmers market. I will be making this dish over and over and over. The leftovers were even better. In a small bowl, combine paprika, cumin, salt, pepper, garlic, vinegar and oil to make a paste. Reserve 2 tablespoons of the paste for roasted vegetables. 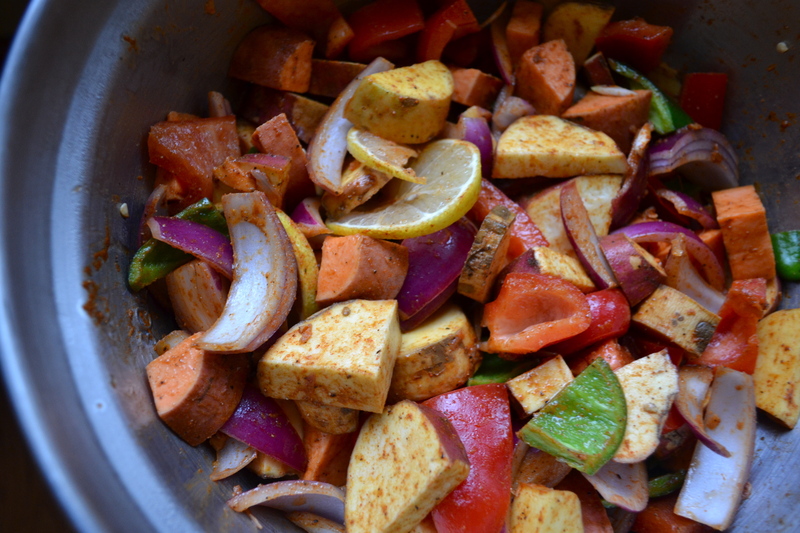 Place onions, peppers, and sweet potatoes in a large bowl and toss with 2 tablespoons of the paste. Reserve remaining paste for the chicken. 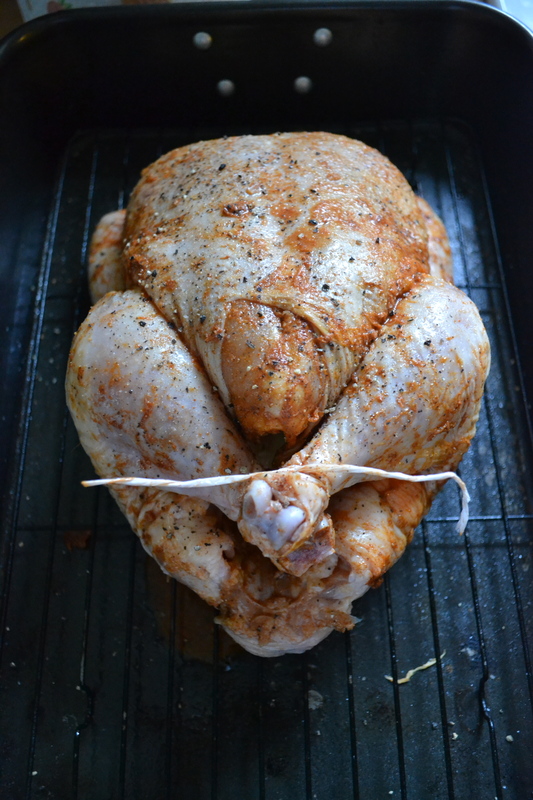 If using a whole chicken, pull off the excess fat around the cavity of the chicken and discard. Rinse and pat the chicken dry inside and out. Place the chicken over the sink or on a plate, rub the chicken all over with 2 of the lemon quarters, and discard the used lemon. Slip a finger under the skin at the edge of the cavity and run it along each breast to gently loosen the skin from the meat of the breasts and thighs. Rub chicken with remaining paste. Gently work a little of the paste between the skin and meat, trying not to tear the skin. If running short on time or using a cut up chicken, skip this part. 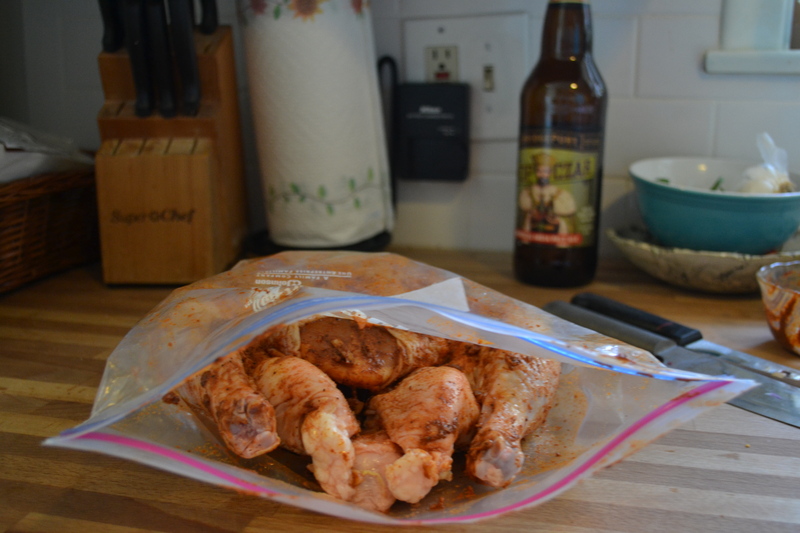 Place the whole chicken or chicken pieces in a 2-gallon resealable bag and pour any remaining paste/marinade on top. Seal the bag. Turn the chicken several times to coat. Refrigerate for 3 to 8 hours or overnight. Preheat oven to 425ºF (220°C). Spray a roasting pan with nonstick spray. Adjust the oven rack to the middle position. Transfer the chicken to a baking dish or roasting pan. If using a whole chicken, squeeze the 2 remaining lemon pieces into the cavity of the bird, place the pieces into the cavity and tie the legs together with kitchen string. Season the chicken all over with 1 teaspoon of salt. If using chicken pieces, just place in prepared roasting pan and season with salt. 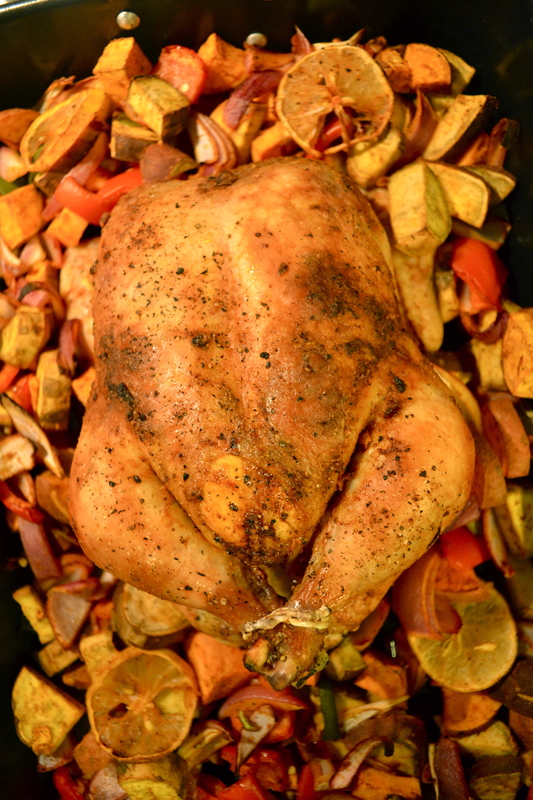 Place onions, peppers, sweet potatoes, and sliced lemon around the chicken (or in a separate roasting pan). Roast the chicken in the oven, basting occasionally with pan juices, until chicken is cooked through and vegetables are very tender, about 1 hour. 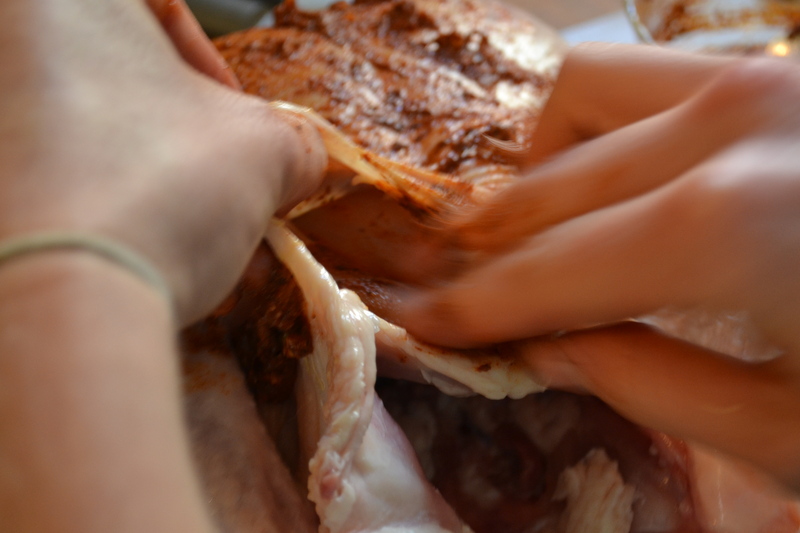 The bird will be done when the juices of the chicken run clear when the thigh is pierced with a fork and an instant-read thermometer inserted into the thickest part of the thigh reads 165ºF (74°C). Allow the chicken to rest for a few minutes after you remove it from the oven. I have recently been into roasting a whole chicken, too! I can’t believe how much food it provides an I’m planning on making soup out of the bones.